The fact that you are reading this article means that you obviously want to get all the information you need before going to the final step – having trough bathroom sink in your washroom. If you are still wondering whether they are fashionable, durable, fit your design, have the necessary qualities … don’t worry, I promise you will find the answers to all your questions in the following article. 1. What Is Trough Bathroom Sink? It is a long rectangular sink with more than one tap that can be used by more than one person at the same time. There are also single faucet trough sinks. For instance, the trough sink is often used in very busy restaurants’ bathroom or in the bathrooms of the college dormitories which usually get frequent and heavy use. A trough bathroom sink with two faucets can be also a good idea for a private home of a large family. In this case, everyone has their own area around the sink. 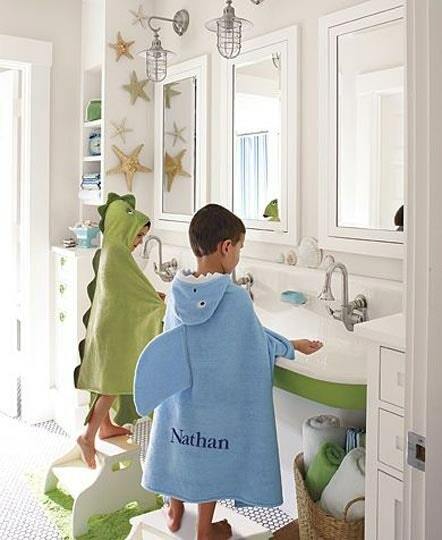 Plus, it’s a lovely way to spend some family time while brushing your teeth. Even if you do not have a large family and have the bathroom for yourself, it is very useful to have a double trough bathroom sink because you’ll have plenty of space in the washbasin itself, where you may need to wash something quickly or wash a slightly larger object by hand. Do you imagine something like that when you hear trough bathroom sink? I guess you are not the only one. The assumptions that they are outdated and can only be found in the old houses, like your grandmother’s one, are totally wrong. In fact, the trough bathroom sinks are becoming more and more popular. Moreover, they are equally well combining with both traditional and contemporary interiors, as well as modern and even ultra modern. 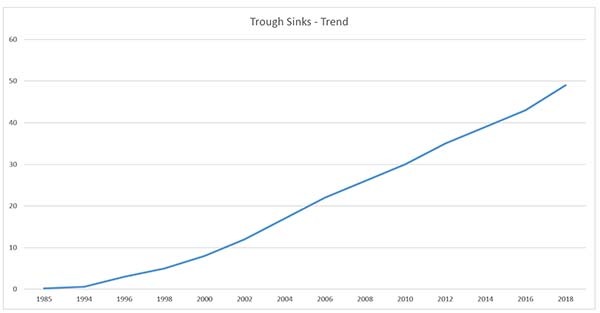 According to some recent research, the trough sink is actually becoming more preferred than the traditional one. 3. Which Are The Main Benefits Of Having a Trough Bathroom Sink At Home? 4. What Materials Are The Trough Bathroom Sinks Made Of? Each one of them has its advantages and disadvantages, so make some research and choose carefully. Keep in mind that some bathroom materials can be customized in order to fully satisfy the overall design. If you are on a budget, the ceramic is the most affordable option. 5. What Are The Types Of Trough Bathroom Sink Installation? The undermount trough bathroom sink is the one that attaches to the bottom of the countertop, offering a smooth and flawless appearance to your kitchen space. As they are positioned below the countertop, there is no lip, so food and other waste can be easily wiped into the sink. For the installation of the undermount sink, there are usually high-strength epoxy, silicone and metal anchors used to attach it to the countertop. This type of trough bathroom sinks is made of cast iron, copper, and acrylic “solid surface” materials. However, the most commonly used material is the stainless steel. Drop-in sinks are the second type of trough sinks. They are designed to drop into a gap in the countertop. A suitably sized hole is cut into the countertop surface allowing the sink installation. Compared to the undermount one, the drop-in sink has one great benefit – an easy of installation. 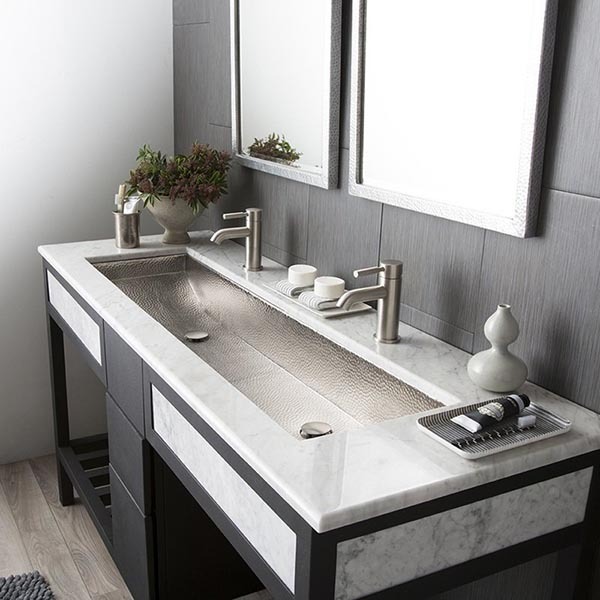 Different materials are used in the manufacturing of this type of sinks, including cast iron, stainless steel, and acrylic “solid surface” materials. The apron sink is also known as farmhouse trough bathroom sink. Its design includes a large apron that drops down the front of the sink or cabinets. The apron sink is the one with the most difficult installation. The most commonly used materials for farmhouse sinks fabrication are cast iron, ceramic, copper, and stainless steel. 6. How Many Faucets a Trough Bathroom Sink Have? The trough bathroom sinks can be with one, two, or more faucets. One faucet – it is a good option when there are no many people living in the house or the bathroom space is very limited. Although it is only with one faction, the sink itself is large enough to do its job perfectly. Two faucets – this is the classic trough sink which is long enough to allow two people to use the sink at once, while not taking up as much space as a double-basin sink. It is also very handy when you have small children because you can wash your teeth or hands together, which is always a good idea when it comes to toddlers. With double faucets, each of you has a separate place without the need for a second washbasin that will take up a lot of space and will deprive you of extra counter and storage space. Needless to say, the price of the two sinks is much higher. 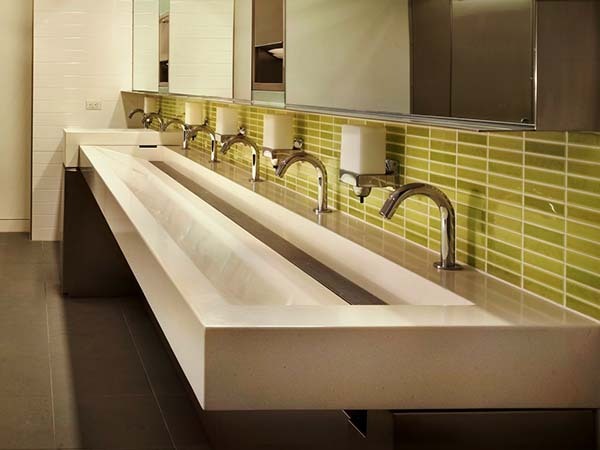 Three or more faucets – the trough bathroom sink with three faucets is are mostly used in public building such as restaurants, offices, and shopping centers. Surely you’ve seen them several times. 7. One Basin or Double Basin? Here the choice is entirely yours. Depending on the dimensions of the sink, you can also take one with two compartments. This is usually the more expensive option. The obvious advantage of a double washbasin is that if you use only one temporary, the other one will always be clean. On the other hand, if you take a single one you will save space and you can increase the counter space. Generally speaking, the double basin sinks are now outdated and the majority of the people prefer to have a sink with one basin. You do not want to take something that’s no longer up to date, is it? Over time, the trough bathroom sink design options have grown a lot. 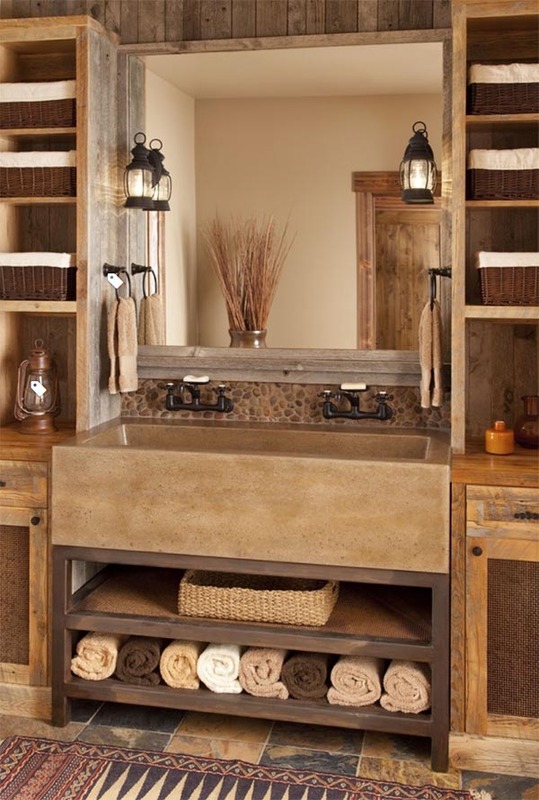 Nowadays, when we hear ‘trough style bathroom sinks’, we do not necessarily have to imagine a cottage or a farmhouse. There are several great modern solutions that fit into the most beautiful interior designs created by the best interior designers worldwide. 9. Can You DIY a Trough Bathroom Sink? In fact, you can. There are trough bathroom sinks made of stone, wood or concrete that people actually do themselves. None of these DIYers can tell you that it’s an easy project unless you already have enough experience working with these materials. Let’s not forget that each of these trough sinks should be enough durable, waterproof, and of course, look good. So, it’s better to hire a professional rather than do it yourself. Yes, you can. There are trough sinks of stone, wood or concrete that people do themselves. Unfortunately, these projects are not that easy unless you already have enough experience with these materials. 10. Are Trough Bathroom Sinks Expensive? Well, it depends on the materials used. For, instance, if you are looking for a custom-made composite granite sink, then it could cost you a fortune. Or, if you are looking for a single-basin porcelain trough bathroom sink, there are many cheap options on the market that you can choose from. 11. What Is The Top Trough Bathroom Sinks Right Now? That’s a great question and we are here to help you find out the answer! 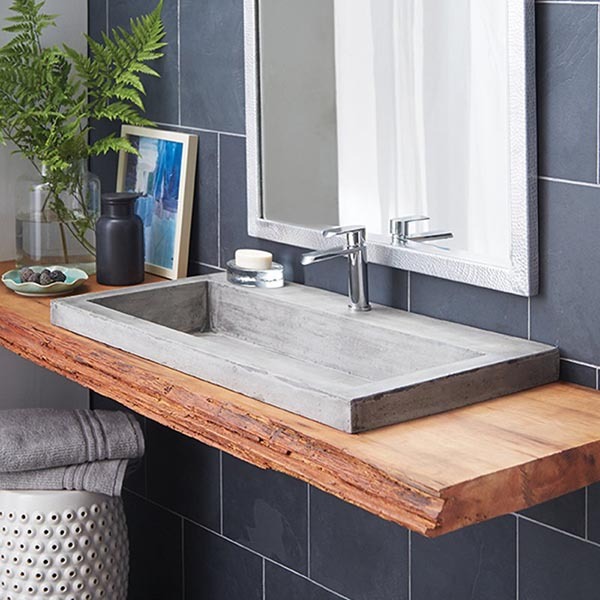 Check out our article: Top 8 Trough Bathroom Sink Models for some useful tips. Conclusion: The trough bathroom sink is one of the fastest-growing types of washbasins because it is very comfortable, a true space-saver, attractive and low-maintenance. 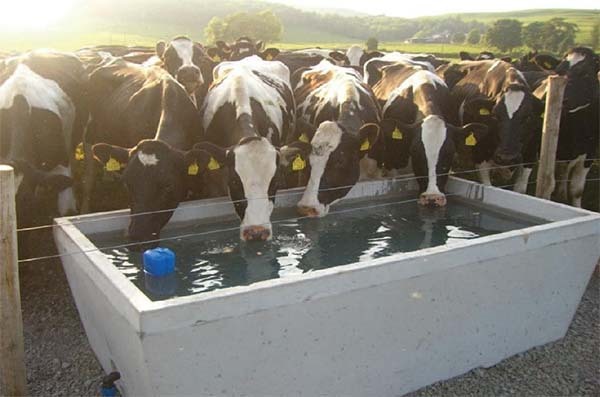 Of course, if you want to buy a top-notch quality trough sink, you would need to spend more money. However, this is a great long-term investment. Keep in mind that plumbing connections and faucets should be added to the sink unless included in the kit. Check before you buy, so there will be no bad surprises later on. If you are going to install it yourself, inform yourself with all the key instructions and buy the necessary tools and fasteners for proper installation and safe use. Each one of these brands can offer you a variety of models,colors and shapes.